No jobs for British Workers! 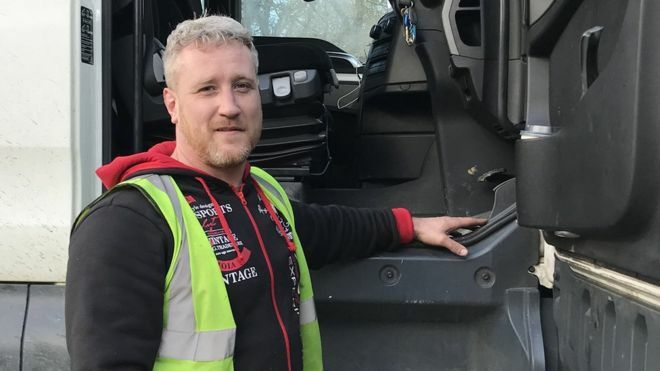 Michael Fowler is a 39 year old family man and has been a lorry driver for the last 12 years. He applied for a job with the recruitment agency Blu Global for a delivery drivers job 8 miles from his home in Salisbury, Wiltshire. On the job application it stated that applicants needed to be from the EU with a good level of English. Mr Fowler (pictured above) was shocked to receive an email in response from recruitment consultant Plamena Ivanova advising him that "our positions exclude British Candidates." Mr Fowler said : "I was just gobsmacked! I thought I must have read the job advert wrong, but I hadn't. I work for agencies all the time. I had applied on Indeed for this job which said you had to be an EU citizen eligible to work in the UK and could speak English. Ten minutes later, I got the email saying: 'Are you British?' I didn't think too much of it at the time. I was taken aback and a bit shocked, to apply for a job that's eight miles from my house and not be able to go for it." A spokesperson for Blu Global said: "We refute any allegations that we, as a business, discriminate in any way against our UK-based applicants. No candidate is denied a chance of employment based on their nationality, age, race, gender or sexual orientation. We can confirm that we continuously place candidates of European and British nationality with all of our past and present clients as we advertise for, and recruit, candidates both in the UK and across mainland Europe. Any deviation from this policy, by any member of staff or any independent person or organisation acting under or using the Blu global brand, is not supported in any way by the company. We will fully investigate this allegation." Blu Global has a British founder and on its website says it has placed 1500 Europeans into jobs in Britain since 2014. This is not an isolated incident whereby it can be seen that certain recruitment agencies and companies are favouring employees from abroad over British workers. Do you agree we need to Leave the EU and help British Workers? Read: "Halal meat report reveals shocking details"